On Monday the two third classes had a cake sale to raise money for a really deserving cause. 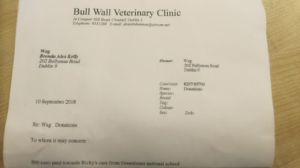 Ricky who is pictured below was taken out of the pound by ‘Working Animal Guardians’. 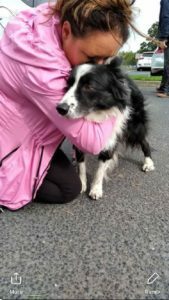 Alex Corrigan from WAG who is pictured above drove him from the pound to Denis in the Bull Wall Veterinary Clinic for help. The two third classes had a bake sale and with the help of the teachers, Ms. Atkin and all the students in Greenlanes raised €500! The money will help Ricky with his vet needs. Ricky will be fostered then rehomed when ready. 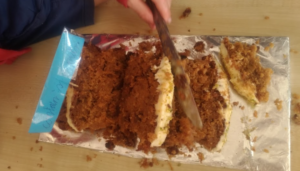 Below are pictures from our class before the cake sale started, a picture of the cheque and a picture of a delicious cake! Thanks to everyone who made this possible and who provided cakes for the sale! Happy Christmas from 3rd class! Mr David O'Sullivan – Third Class 2018-2019 © 2019. All Rights Reserved.